I haven’t done one of these posts in a while. If you follow me on Instagram or Twitter you’ll see that I gave a preview last week of today’s Meatless Monday, which is a two recipes in one! I wanted some pasta and arugula (arugula for recipe one and spinach for recipe two) for lunch, so I whipped the first recipe up. I had leftover orzo from the first recipe and had spinach laying around and decided to make a frittata for the second recipe, using almost the same ingredients. Both equally delicious. Cook pasta according to directions. (Note: You could make 1/2 cup of orzo and use half of it for this recipe and the other half for the next day like I did.) While the pasta is cooking, cook the egg to your liking. Sunnyside up, over easy, scrambled, etc. 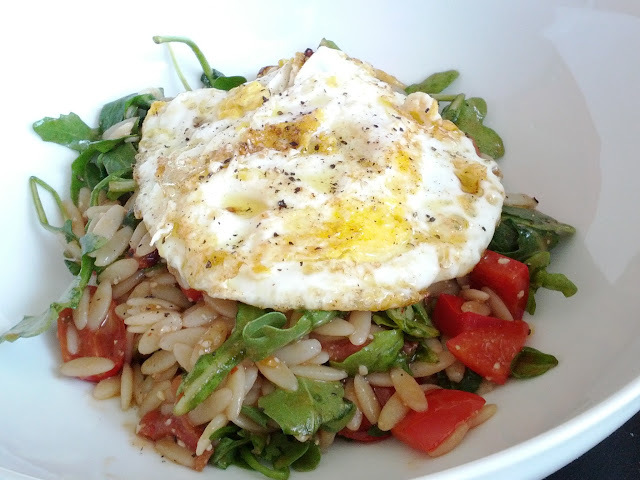 After the orzo is done cooking, drain the orzo and place in a bowl along with the arugula to slightly wilt the greens. Add the remaining ingredients minus the egg and toss to incorporate together. When done, top with egg and enjoy! Cook orzo according to directions. When ready, drain and put aside. In a bowl, whisk the two eggs and milk and set aside. Heat an ovenproof pan over medium heat. Melt butter. When melted, add shallots. When translucent, add garlic. The garlic will become fragrant within 30 seconds, at that time add the red bell peppers. Cook for a minute, then add the spinach. When the spinach is wilted, add the cherry tomatoes. Cook for a minute, then add cooked orzo. Saute and add red pepper flakes, salt, and pepper to taste. Add the whisked egg to pan. Ensure that it’s in all the crevasses of the pan. Sprinkle the cheeses over the frittata and place the pan into the oven for 8-10 minutes or until the egg settles. Enjoy! Hope your Monday is going well!